Joe Casey and Ben Marra team up here to graft a highly idiosyncratic reading of The Gospels onto the Paul Gulacy-era Master of Kung Fu. Get ready for non-stop martial arts action accompanying mind -altering theological twists, all in the service of forging a comics book sprituality that links the mind, body and soul in this 60 page, full color, hard cover graphic novella from Image Comics. 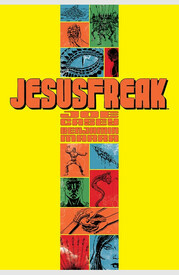 Joe Casey and Ben Marra employ a highly idiosyncratic reading of The Gospels to answer the question, "What If the 1970s Marvel Comics series, Master of Kung-Fu featured Jesus instead of Shang-Chi, but was still drawn by Paul Gulacy?" Get ready for non-stop martial arts action accompanying mind-altering theological twists, all in the service of forging a comic book spirituality that links the mind, body and soul in this 60 page, full color, hard cover graphic novella from Image Comics.